Annie Mole at Going Underground has been to Battersea Power Station to check out the developer's exhibition of plans for the site. She's posted photos of the information about the proposed Northern Line extension. You can see on their tube map that, as I suspected, they're only connecting to the Charing Cross branch at Kennington. Most trains from that branch terminate at Kennington anyway, where they go round a huge loop to reverse, and it would be reasonably straightforward to plumb the extension into that loop rather than any of the running lines. There's be no access to the Bank branch from Battersea, but there would be an easy cross-platform interchange at Kennington. The exhibition is open for its last day today until 6pm, and includes a tour of the power station site. According to Annie, you may also be able to visit on the 13th and 19th. Check the developer's website for more details. Battersea station is on the south edge of the development where it could serve other parts of the local area. Above the key there's the outline of a second station, on Wandsworth Road bang underneath Vauxhall Sainsbury's. Nice photos by A Mole. Am I mistaken or have the exhibition organisers employed the same artist who gave us their impressions for the Croxley Rail Link and Watford Health Campus? Not that I imply either scheme is doomed, no, certainly not. The idea! That proposed extension is a gobsmacking example of the developer's sense of self-importance. A bizarre lengthy right-angled spur which fails to stop anywhere useful between Kennington and Battersea, and no attempt to extend the line beyond Battersea to provide much-needed tube connections in southwest London. It's just a me me me attempt to attach themselves limpet-like to the tube network, and stuff any benefits to anyone else. So we're going to have "Vauxhall South" and "Battersea" stations? ELL phase 2 won't serve Battersea Park. It'll serve Wandsworth Road one stop south, before heading west to Clapham Junction, passing a little south of Queenstown Road. The track is all on viaduct and due to the junctions and curves and other tracks there's no obvious location for platforms anywhere nearby. Am I being dense, but is there a reason why they don't want to extend the line that little bit further so it's actually under Battersea Park station, allowing for easy interchange? Will this result in the permanent division of the Northern Line both at the north and south ends? Will there be any implications for the Cross London Tram proposals? 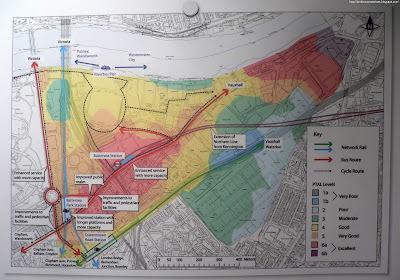 Assuming Battersea was only a temporary terminal which other routes could be projected south and west? Merseytart: Because then it wouldn't serve the development. I know there's a school of thought that says new stations should serve other rail stations, but sometimes it's nice to serve destinations too. Mwmblws: The Northern Line is already pretty much split at the south end. There are very few Charing Cross-Morden trains. I would like to see the line extended west to stations at Albert Bridge Road, Kings Road Chelsea and thenjoining the District line to Wimbledon at Walham Green just nprth of Parsons Green. Crossrail 2 could then take the shorter central tunnel alignment the Southern Region LSWR Mainline from Wimbldon to Vauxhall before striking north to Farringdon ,Dalston Junction, Stratford, Epping and Stansted. Mwmbwls, I don't know about that. I think it would be better if Chelsea had a direct connection to Victoria. What you could do though is to extend it from Battersea to Clapham Junction (end of its isolation from the tube network). But there's further you can go: Wandsworth, Roehampton (ending their isolation from the tube network). You could build quite a shallow tunnel (even overground track) to get past Richmond Park and even get to Kingston. Why not combine serving the destination (development) and other stations by extending the line one stop further to either Battersea Park or Queenstown Road? Assuming the Northern Line is in tunnel, then it should be possible to site the station such that there is interchange to both mainline stations. A good terminus design would also allow the possibility of a further extension should someone come up with the funds. There are very few Charing Cross - Morden trains, except in the peak. It would be interesting to see what the capacity implications were south of Kennington during the morning peak if this happened. The Northern line extension should interchange with Battersea Park station so that passengers on trains to Victoria can use it. This would reduce congestion at Victoria tube station. I don't think it is acceptable to build new railways which deliberately avoid connecting with existing railways. Better interchanges will reduce journey times and reduce congestion by preventing unnecessary journeys. Battersea Park Railway Station risks becoming a ghost train station, esp Plat 1&2 when the Overground Service Starts. Why not run an overground service into Victoria as well as Clapham Junction? Its crazy. What about the north part of the northen line? Connecting edgware to muswell hill via mill hill east, finchley and highgate should also be looked at due to the heavy traffic and poor transport links.